Lonely Planet announced at Google I/O a live implementation of the Google Maps API v3. The new API is being used on Lonely Planet's touch-screen-targeted site touch.lonelyplanet.com, and it currently works on iPhone and Android phones. This is the first implementation of the new API on a mobile. The mobile site allows the user to access Lonely Planet's huge database of travel guides. If you have an iPhone or Android phone you should definitely bookmark touch.lonelyplanet because it gives you mobile access to information about restaurants. hotels, shops, tourist destinations and clubs for just about anywhere in the world. You can view the location of all entries on touch.lonelyplanet on a Google Map. It is also possible to view other nearby entries on the Google Map and, because Lonely Planet are using v3 of the Google Maps API, it all works in the blink of an eye. Pegman, the Google Maps Street View icon, is this weekend visiting The French Open in Paris. For such a special sporting occasion Pegman always wears the appropriate attire. If you look at the Street View imagery around the Stade Roland Garros you will find that Pegman is wearing a rather fetching headband and is ready for action with his own tennis racket. Update: Unfortunately all the free codes have now been issued. However you can still purchase the application from the Apple App store for only $2.99. 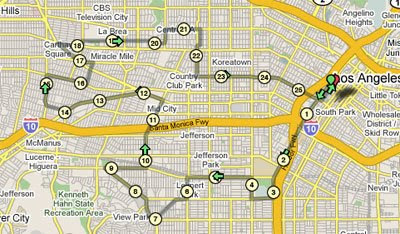 WalkJogRun.net's iPhone and iPod Touch application can help you find exercise routes from the premiere route mapping site directly from your mobile phone. 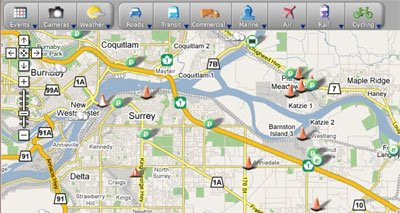 The application uses the iPhone and iPod Touch’s built-in location services to find routes where ever you are. 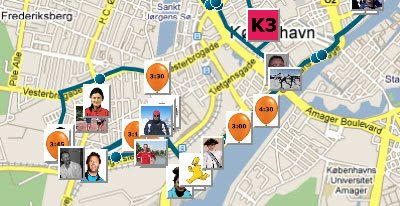 The application also allows you to view the routes that you have uploaded yourself to WalkJogRun.net, in one convenient place. The application normally costs $2.99 but WalkJogRun.net are generously allowing 20 Google Maps Mania readers to download the application for free. To get a free code to download the application just leave a comment on this post with your e-mail address. The codes will be given away on a strictly first come, first served basis. Comments on Google Maps Mania are moderated and I will not publish your e-mail address. I will therefore be the only one who will see your address. Unfortunately Apple restricts the codes so that they can only be used in the US Apple app store. The codes expire four weeks from today and are only good for a single redemption. To use the code I e-mail you just click "redeem" from the iTunes store home page. 360 Cities created this interactive panorama of the Street View Cave at Where 2.0. Every home should have one. 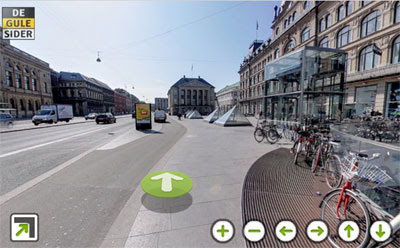 Gadefoto have released a street view type product for Copenhagen in Denmark. The site seems to be using TeleAtlas for the mapping part of the application. 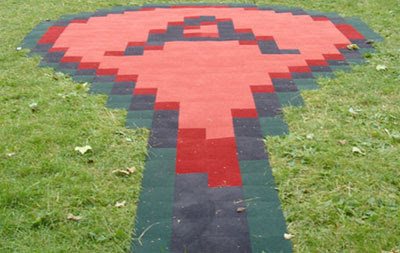 Robert Sollis, a student at the Royal College of Art, made this Google Map Marker carpet. That's right, every home should have one. The Google Maps API v3, released yesterday in Google Code Labs, has its own dedicated demo gallery. The gallery features demo maps from members of the Google Maps team and from some well established Google Maps gurus. 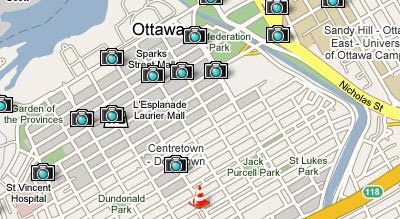 The gallery includes a number of Google Maps that demonstrate a range of features available in the new Google Maps API. The gallery covers the basics, like adding a simple map marker and displaying infowindows, to more complex features like geocoding, reverse geocoding and finding the location of the map user. Trapster, the US speed trap locator, has released a test map using the Google Maps API v3. The map seems to show a snapshot of the driving speeds of anonymous Trapster users. Trapster users are shown on the map by colour coded map markers. Red markers appear to indicate drivers who are currently driving under 30 mph, yellow markers those driving at 30-60 mph and green markers those driving over 60 mph. 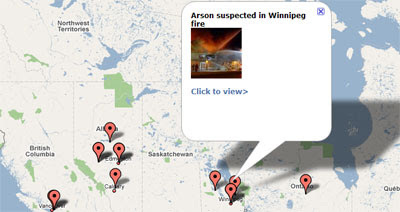 CTV, a private broadcaster in Canada, has created a Google Map that features user-submitted news and photos. Registered users of CTA's website can submit news stories and photographs to the network by completing a short form. The MyNews Mapper shows where the latest MyNews submissions to the network have come from. 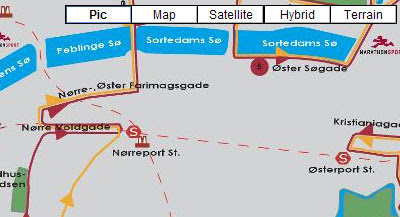 Submitted news and photographs are shown on the map by red map markers. Each story and/or photograph comes with a link to the the main story on the CTV website. The Guardian newspaper are asking readers to submit their photographs of vacations in the UK to a new Flickr group. Readers are asked to geo-tag their photographs when uploading the pictures to Flickr and the images will then appear on The Guardian's 'Staycation' Google Maps mashup. 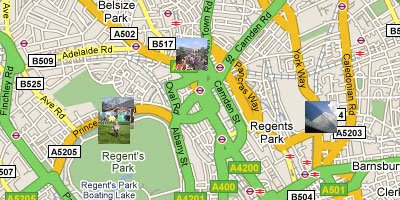 The Guardian are using Google MyMaps to display the submitted photographs which means readers can view an embedded map on The Guardian website or view a larger version on the main Google Maps website. As you can see after an initial walk down to the beach, my hike was very flat as I was at sea level for most of the walk. HeyWhatsThat has also just launched a testbed for the main panoramic profile page. The new page allows the user to view two independently adjustable profiles. This allows the user to compare options. The new options allow you to add horizontal and vertical scale, see lines of sight or view a great circle (or geodesic) path. 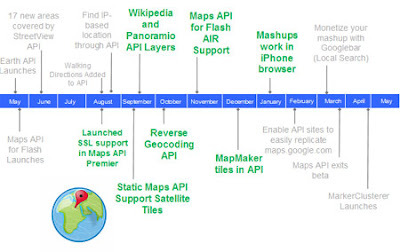 Google have today announced version 3 of the Google Maps API. The new version has been released as part of Google Code Labs, which means it is available now but only with basic features. The main features of the new release seem to be faster rendering of maps, better implementation of maps on mobile devices and better geo-coding. Google have also launched a new discussion group especially for users of the new version of the API. Google today also launched Google Web Elements, a set of widgets of Google products which can be embedded in any web page. One of the elements is Google Maps. It has been possible for a long time to embed Google Maps in a web page by cutting and pasting the i-frame code from the 'link' section of the Google Maps home page. However, the new Google Web Element for Google Maps is a simple to use wizard that lets users add a marker to a map, set the zoom level and the size of the i-frame. Yesterday Google added first generation maps for 64 new countries and territories to Google Maps. All the new mapped areas are the result of work by users of Google Map Maker. The image above shows the map for Lahore, Pakistan before and after the new release. 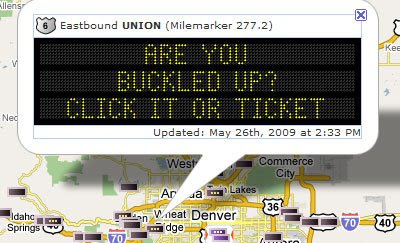 The Colorado Department of Transport is using Google Maps to display live traffic conditions for Denver. The site has four separate maps; one showing road conditions, one showing the current average speeds on roads, one that displays current road works in the city and another that lets you view the messages currently displayed on road signs. Traffic conditions for the map is provided by the Intelligent Transportation Systems (ITS) a branch of CDOT. The maps also include live traffic web cams, information from local weather stations and travel alerts. The City of Ottawa has a new interactive traffic map which uses Google Maps to provide comprehensive traffic information for the city. The map includes information about traffic incidents, construction and events, parking lot location and vacancy; and also displays streaming web cams for major intersections. Live data feeds provide up-to-the-minute Ottawa traffic details. The site even lets you view the messages currently displayed on the city's road signs. LuckCal uses the Google Calendar Data APIs and the Google Maps API and links in with your social networks. In essence it means that each appointment you make in Google Calendar becomes a search query that recommends events for where you are going to be. LuckyCal uses the location that you enter under the 'where' section when you enter an event into Google Calendar to determine where you will be. Whenever you put a location in the event in your calendar, LuckyCal will assume you're at that location for the duration of the event. LuckyCal then finds friends and events nearby. At the centre of all this is the Google Maps API. The map displays your nearby friends and events that you might like to attend while you are on a trip. 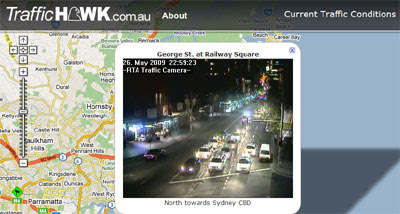 TrafficHawk.com.au is a Google Map and traffic information mashup for drivers in Sydney, Australia. The map displays up to the minute RTA traffic alerts (accidents, road works and alerts) and photos from live traffic cameras. Current traffic hazards are shown on the map by exclamation mark map markers and the webcams are represented by green camera icons. If you zoom out of the default view of Sydney you can also view current hazards for the whole of the New South Wales area. The Vacationeers, whose YouTube video of Google Maps was a huge internet hit, have now been hired by Google themselves. Google have hired the team to create comedy videos of a number of the company's products. My favourite YouTube video at the moment, however, has to be this altered version of an REM song. It's called 'Map Of The World As We Know It'. Google recently launched Google Maps Malaysia, a localised version of Google Maps for this Southeast Asian country. It therefore seems an opportune time to have a quick look at some of the Google Maps mashups coming out of the country. iProperty.com has a number of real estate sites for Singapore, Malaysia, Hong Kong, Taiwan, India and the Philippines. 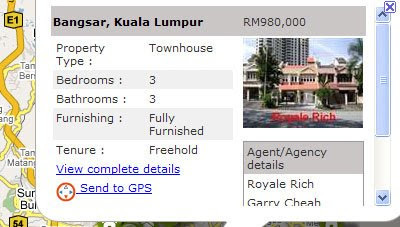 The company claims that its dedicated Malaysia website is the most visited property and real estate website, with the largest online database of properties for sale and rent in the country. The site uses Google Maps to display the locations of properties for sale and as a means to browse its large database of available properties. It is possible to search for properties on the map by location, price and property type. The site also includes the option to download the location details of properties to a GPS unit, which should prove invaluable when users are ready to visit their selected properties. P1 are providers of wireless broadband in Malaysia. The company provide a Google Maps mashup that shows customers where connectivity is available. It is possible to enter any address into the map and the areas with connectivity are shaded in green. Also shown on the map are the locations of shops where you can buy P1 Wimax. Each shop displayed on the map comes with a get directions link which, when clicked, will display driving directions to the shop from the location you entered into the search box. The official tourism website for Malaysia has produced a Google Map to showcase the delights of the country. It is possible to search the map by location and it is also possible to select the category of results you wish to see displayed on the map. The available categories are Landmarks, Interesting Places, Shopping, Culture & Heritage and Parks. Each category comes with its own design of map marker. It is therefore possible to differentiate easily between the different types of search result on the map. Listed below the map are a number of the more popular tourist destinations in each area. This means it is possible to quickly locate on the map the places that you most likely wish to visit. 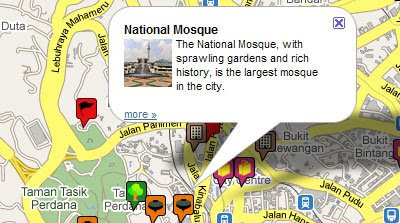 Mapdoo allows users to search for places in Malaysia. 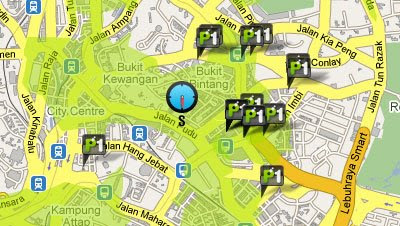 It is possible to search Mapdoo for streets, places and businesses in Malaysia. Anyone can use Mapdoo for free and you can even add your own business to Mapdoo's listings. The map has thousands of businesses listed and it is possible to search this huge database of mapped locations either via a search box or by selecting the type of business from a range of options. Vancouver TransLink, the BC Ministry of Transportation, Transport Canada, Western Economic Diversification and the Vancouver Port Authority have got together to provide the ultimate transit map of Vancouver. The website includes seven Google Maps, one each for motorists, transit users, cyclists, users traveling to adjacent regions, visitors and commercial vehicle operators. The maps show real time traffic incidents (accidents, police incidents etc), current construction projects and events (parades, special events etc). The maps also include live web cams of road conditions. Additional information about conditions on highways, parking options, bridges and tunnels throughout the region and weather can also be viewed via tabs at the top of the map. There are also options for alternative travel such as ride-share and taxis. Each of the seven maps comes with a number of different options. I haven't the stamina to list them all. I advise you to check out the maps yourself and, if you live in Vancouver, bookmark this site now. Roz Savage, a British ocean rower, is attempting to become the first woman to row solo across the Pacific. In 2008 she completed Stage 1, becoming the first woman ever to row solo from California to Hawaii. Yesterday Roz set off from Hawaii on Stage 2 of her journey. You can follow Roz's incredible journey live on a Google Map which is tracking her progress. 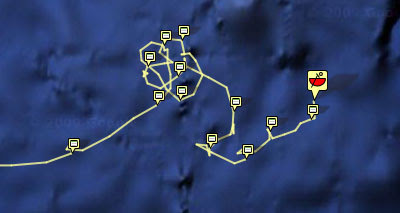 The map shows her current position with a cartoon style map marker of Roz. When clicked an information window opens displaying the current voyage statistics. Roz's journey so far is shown with a polyline. The polyline contains map markers with links to her blog, her latest Tweets and photographs of the journey that have been posted to Twitter. Soren Johannessen of Microformats.dk has pointed me towards the Pull Together website. Pull Together is another initiative of Roz Savage. The campaign is an attempt to get eveyone to undertake a little more exercise. Roz will make an average of 10,000 oarstrokes each day over the roughly 100 days it will take her to complete Stage 2. The idea is that you can match Roz one step for one stroke, each day. Ten thousand steps is about 6 miles or 2 hours of walking. The site features a Google Map of people who have signed up to take part in the challenge and also points users to the GMaps Pedometer, where you can record and track the distance you walk or run each day. Incredibly Roz Savage is not the only person currently attempting to row the world's oceans. Oliver (Olly) Hicks is attempting to become the first person to row solo around the world. Oliver is taking along a water-resistant laptop which means the world can follow his progress via Google Maps and Google Earth. The Google Map of Oliver's journey is on the landing page of the Virgin Global Row website and the map contains links to Oliver's blog posts on his journey. Update: It seems Olly has actually suspended his attempt, having reached New Zealand. The less adventurous of us prefer to do our rowing virtually on Google Maps. Every now and again Google Maps driving directions throws a curve-ball into a suggested route. 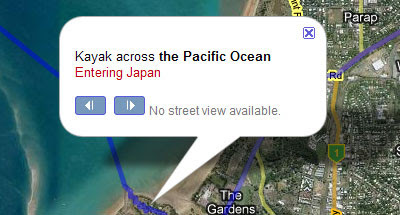 One example is that when you ask for driving directions from Australia to the USA Google Maps often advises you to 'kayak across the Pacific Ocean'. The official site of the Los Angeles marathon has produced a Google Map showing the route of today's course. The route map shows the start and finishing points and uses numbered map markers to indicate drinking points along the route. 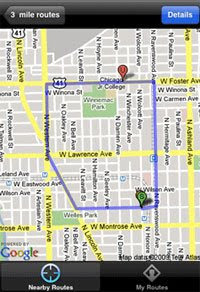 The official site of the marathon has also produced a Google Map Spectator Guide. The map shows Entertainment Centers on the route. The Entertainment Centers are neighborhood street festivals. All of them are sure to be great places to watch today's run. The map also shows you where live bands will be playing and where cheerleaders will be performing. Courts Of The World (COTW) is a new website for street basketball players from all over the world. The site includes a feature called the "Court Finder", which enables users to find public basketball courts in their neighbourhood. The court finder is a customized Google Maps application with user generated content. Registered users are able to add new courts to the map. It is possible to find courts on the map by entering a location into a search box and selecting a radius distance that you wish to see results for. Alternatively, it is possible to select a country or city from a list displayed under the map. In recognition of Memorial Day, Virender Ajmani has created a series of Google Maps that commemorates the U.S. men and women who have died while in the military service. If you wish to find your nearest national cemetery you should check out this Google Map. 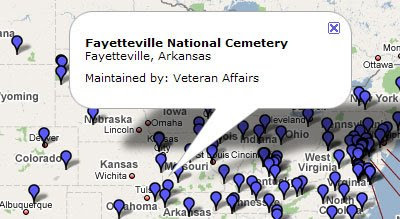 The map shows cemeteries which are maintained by Veterans Affairs, the National Park Service and the Army. 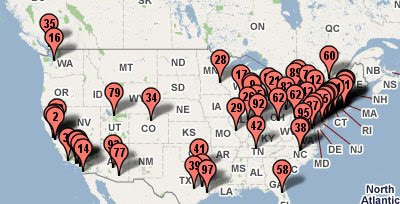 Using data from iCasualties.org this map shows the 154 Michigan citizens who have lost their lives in the Iraq war. This map displays the number of deaths that each state in the USA has lost in the Iraq war. Again using data from iCasualties.org, this map shows the 104 women casualties of the Iraq war. Sean Askay has produced a Google Earth file to honour servicemen and women who, since October 2001, have lost their lives in Iraq and Afghanistan. You can read more about this amazing Google Earth kml on the Google Earth Blog. In Denmark the Copenhagen Marathon has started and Endomondo has created a Google Map that seems to be tracking live a number of the runners. The race started an hour ago, so if you want to see this map in action you will need to view this map within the next few hours. The route of the race is shown on the map and the current position of the entrants is shown with small profile pictures. If you just want to see the route of the marathon Soren Johannessen has used the CASA Google Maps Image Cutter to present the official route map within the Google Maps API. Presenting the official route map in this way means that you can move the map around and zoom in on locations. 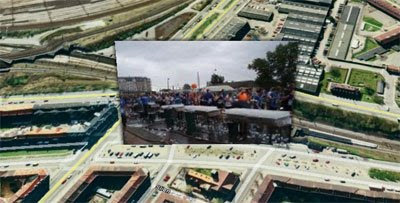 Now the marathon is over Soren has created two Google Earth plugin maps showcasing two photographs he took of the race. To view the photos press the button at the top left of the plugin. Weather Tweet is a new Google Maps mashup that maps Tweets about the weather. Currently the site has maps for the UK, Birmingham, London, Germany, Berlin, France, Paris, New York and Tokyo. It's easy to use weather tweet. All you need to do is tweet using the special weather tweet tag #weather_me followed by your town or postcode. You then need to tweet the weather type and a brief description, including links to pictures if you want, e.g. #weather_me Birmingham, cloudy, It's cloudy in England's second city. The Weather Tweet map is updated with new messages every five minutes. Total Film have put together a collection of Street Views of 25 movie locations. 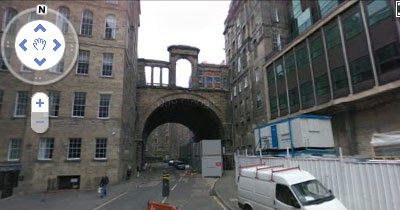 Pictured above is one of the locations in the film Trainspotting. 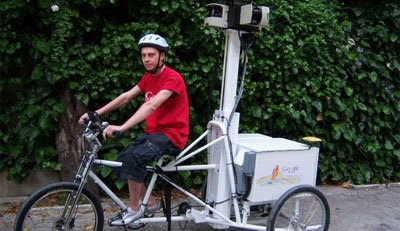 The Google Street View trike will be out and about in the UK during the summer. Google would like the public to send in their most inspired suggestions for the places the trike should visit in Britain. At Where 2.0 Daniel Chu of Google presented on the updates to Google Maps this year. I liked his slide that shows a timeline of the developments. If you want a more readable version click on the image to open the presentation in PowerPoint. With content generated by architects, historians, urban sociologists, and archaeologists, as well as the general public, HyperCities is a Google Maps mashup of historical maps of some famous world's cities. Currently the site has a series of historical maps for Berlin, New York, Los Angeles and Tel Aviv. 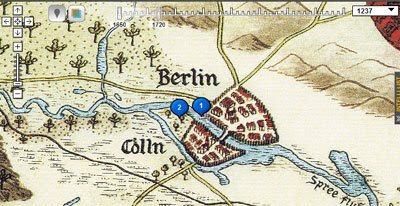 For each city the historical maps are listed under the Google Maps interface. Clicking on a year loads the historical map for that year as an overlay on top of Google Maps. The map markers on the map can also be viewed by their historical relevance. At the top of the map is a timeline slider which can be used to load map markers for any historical period. No, the population of Denmark is not directly related to the consumption of American pizza, it's just prolific regular Google Map mashup creators, Soren Johannessen and Virender Ajmani, both have new maps out today. Statistics Denmark has just released estimations of the populations in the 98 municipalities in Denmark until 2040. Soren has mapped the statistics for all 98 municipalities. Soren says the map took only one hour to produce. He used Google Spreadsheet Mapper 2.0 to produce the KML and then imported the KML via Map Channels v3 map creation tools. Soren says it is a very quick way to produce maps and would be ideal for the news media, who often have very short deadlines. The map itself lets you click on any of the Danish municipalities and see population projections for the area up to 2040. GQ has published a list of the 25 Best Pizzas in America. Virender has taken the addresses of each pizza restaurant and produced a map that let's hungry pizza lovers find their nearest best restaurant. The restaurants are listed in the map sidebar in chronological order and on the map with numbered map markers. The information window for each map marker gives the name and address of the pizza restaurant. The Guardian are becoming regular users of the Google Visualization API to create interactive rich media content for their website. Two weeks ago The Guardian used the API to create a Best Boutique Hostels Map now they have produced this Alternative Festivals Map. The map is as an interactive guide to small UK events, up-and-coming European festivals, and readers' tips from across the world. Using the Visualization API means it is very easy to create a tabbed sidebar of the mapped data. In this map The Guardian have tabs for 'Alternative UK Festivals', 'Our Euro Picks' and 'Reader's Tips'. TopobioGraphies is a a new collaborative Google Maps mashup about Catalan's exiled from Spain after the Spanish Civil War. The site, created by the Universitat de Oberta de Catalunya, is mapping the stories of individuals and the literary stories relating to Catalans exiled in 1939. The map hopes to engender a better understanding of the men and women who were unfortunate enough to have to flee their homeland seventy years ago. It is possible to search the map by country, or by the latest or most popular life stories. Each individual's biography is given their own map page that shows the exile's journey after leaving Spain. Numbered map markers, when clicked, provide short explanations of each stage of the exile's life journey. If you have a story about someone who was forced into exile after the Civil War it is also possible to create a mapped biography for them on TopobioGraphies. Google Product Managers Steven Lee and Lior Ron spoke todat at Where 2.0 about the Evolving Geoweb. They have announced a location aware browser partnership with Mozilla FireFox 3.5. The Google Maps Ad Unit is a new way for Google Maps API developers to monetise their Google Maps mashups. The ad units update with geographically relevant ads as the user pans the map. To see the Maps Ad Unit in action, take a look at Acme Mapper and ZipMaps who have both added it to their Maps API implementations. The Google Maps Data API provides free hosting and bandwidth for your map data. The geodata is available across platforms; web, mobile phone, 3D applications, or even command lines. 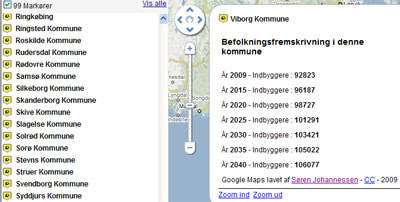 Geodata from the Google Maps Data API can be instantly indexed and made searchable in Google Maps. My Maps Editor for Android allows users to create and edit personalized maps from an Android mobile phone. Integration with the phone's location and camera makes it easy to document a trip with photos and text on a map. My Tracks enables Android mobile phone users to record GPS tracks and view live statistics while jogging, biking, or participating in other outdoor activities. Stored with Google Maps Data API, these tracks can be accessed, edited and shared using the My Maps feature in Google Maps. To coincide with the start of Where 2.0 Schmap.me have released a new Twitter account that retweets Twitter user comments about local restaurants and bars. It also lets Twitter users tweet their own restaurants and bar picks. Each of these local tweets have short Schmap.me links so followers can quickly find the local pick on a Google Map. If you want to recommend a San Francisco restaurant, bar or pub you can add a rating, short review and optional photo before tweeting your pick, on this Schmap.me page. Cartifact Maps, has today released a major update to their visually enhanced version of Google Maps. The new release enhances the current Los Angeles maps and adds maps of Manhattan. In LA, Cartifacts have assembled an incredibly detailed map of 1887 LA and added it to their innovative lens tool. In NYC, there is a building level detailed map of Manhattan below Central Park. The lens tool for New York features a Historic tab with an 1865 Sanitary & Topographic map for the Council of Hygiene which shows all the original water courses of Manhattan Island and is from the David Rumsey Map Collection. Another new addition to the lens tool is an Oblique 3D Buildings view rendered by Union Design for CB Richard Ellis. Cartifact Maps beta v1.1 launch coincides with this year's Where 2.0 conference in San Jose where Cartifact Labs Director Bruce Daniel will be conducting a workshop on "Thinking about Map Design" and presenting to the conference a personal survey of visually rich maps. "Report bad drivers, track license plates, zap a tag and upgrade your commute. Compliment a carpooler. Lash a litterer. Tattle on a tailgater. Snap at a speeder. Bring accountability back to our streets the Web 2.0 way. Don't get mad on the road. Get even online." To use the site you simply enter the licence plate number of the car that has annoyed you and enter a location. Zapatag.com then places your message on a Google Map. It is possible to browse through the messages submitted by other users by state, by the latest zaps, by the most commented on or by most favourited. Just don't zap whilst driving or you just might find your own car listed on the map! Tufts is the latest university to build an online campus map using the Google Maps API. The map shows all the university buildings on the Medford/Somerville campus. A really handy feature for students is that it is possible to find where all the wifi hotspots on campus are using the map. If you roll over any building on the map with your mouse the building is highlighted and a small information window tells you the name of the building. The buildings are also all listed in the map sidebar and it is even possible to use a search box to find a building. SchoolBubble.com is a network of marketplaces for students at universities in the USA and Canada. Using the map students can post and find ads for car-pooling, housing, textbooks and jobs. Each university comes with its own Google Map. The ad listings are shown alongside the map and it is possible to filter the ad results by category. The Study Worldwide Map shows the the two major higher education ranking results on Google Maps. It is therefore possible to use the map to search and find the highest ranked universities in the world. It is possible to refine your search for a university by the QS World University Ranking system or the Shanghai Jiao Tong University Ranking system. The universities are then shown on the map with numbered map markers to indicate their rank and displayed in descending order in the map sidebar. It is also possible to refine the results by country. US Universities -over 8,600 US colleges and universities. Canada Universities - a Google Map of Canadian universities. Each tag includes the university's address and a link to its website. French Universities - a Google Map of every French University. UK Universities - every UK university and HE institute. Frank Taylor of the Google Earth Blog has written a great post on a new Google Earth plug-in game called 'Ships'. Frank says it is the best example of the Google Earth API that he has seen and I've got to agree. Frank's walk through video should whet your appetite. Now read The Google Earth Blog review for more details about the game. Garmin are using the Google Maps API to display the different g2 and g2 Vision coverage regions in the US. The map shows the range of offshore marine maps that it is possible to buy from the company. 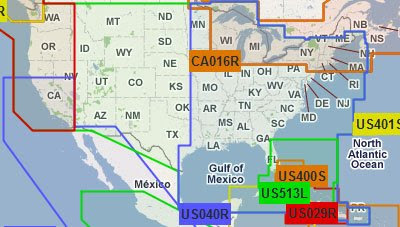 It is possible to define the region coverage size to display on the map. It is also possible to click and drag the map to a different area or zoom in/out of an area, then click "Refresh List" to see a new list of region coverage on the map. The region coverage displayed on the map is also listed in the map sidebar so you can easily click the item you wish to purchase. 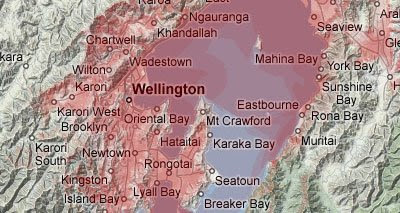 Vodafone NZ have released a Google Maps mashup that shows mobile phone coverage in New Zealand. 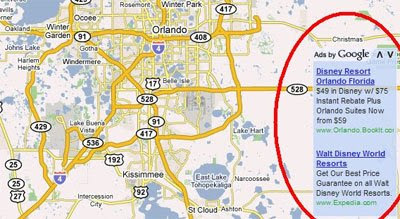 It is possible to search for coverage by address or to use the Google Map navigation tools to zoom in on any area. Coverage results can be refined by G2 or G3 Broadband or 3G Broadband extended and it is also possible to see coverage for different makes of mobile phone. 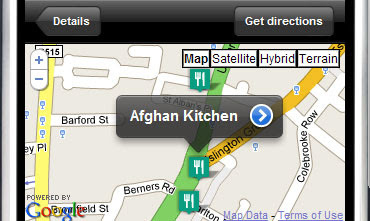 ThinkWrap's Google Maps Development team are experienced Google Maps developers. They use Google Maps to deliver solutions on both web and mobile platforms, and for clients in retail, entertainment, non-profit and government sectors. The team exists "to help you connect with proven developers." 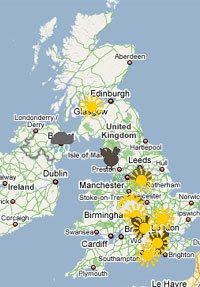 The UK Met Office is showcasing an experimental Google Maps mashup of UK weather. The map forecasts rainfall, cloud cover and air pressure over the UK for the next 48 hours. Wayne's Weather Watcher uses data from WUnderground.com to show you the weather, wherever you happen to be. It is possible to enter a zip code or address to get a weather report for that location. 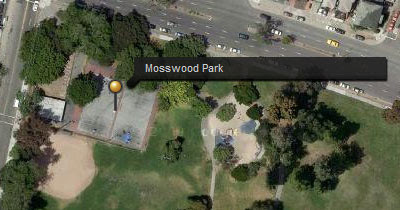 Alternatively, it is possible to pan the Google Map and the map will update to show the weather for your current view. The map includes options to Show Radar, Animate Radar, Show Counties, Show Warnings and Show Temperatures. Mibazaar has created this Google Map to show the Chrysler Dealerships that are being closed in Michigan. The map shows a cluster around Detroit, which seems to be the area most affected in the state. The closing dealerships are shown on the map and are also listed in the map sidebar. 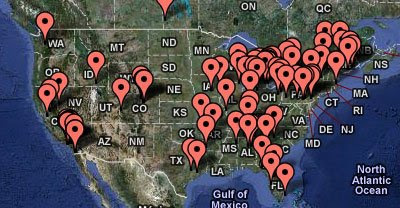 If anyone wants to map the whole country the Chrysler dealerships closing list is available here. The list includes the full postal address of each dealership so it should be a fairly painless to task to geocode the whole list. Apparently in the UK today is National Work From Home Day. The day is meant to encourage people to work from home, instead of commuting to their usual place of work, in order to promote smarter working practices, such as flexible, remote and mobile working. 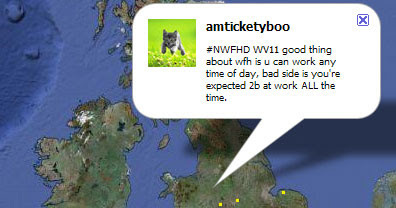 To promote the day Speed Communications have created a Google Maps mashup that shows all Twitter messages tagged #NWFHD. If Twitter users add the first of half of their post code to the tag they will then be shown on the map, e.g. “#NWFHD WC2H”. The map updates every 30 seconds. The Google Maps team in Japan have been using the Street View cameras mounted on a three wheeled bike to access areas that the Street View cars cannot reach. The video below shows the Street View Tricycle in action and, it seems to suggest, some amazing Japanese temples are going to be appearing in Street View soon. 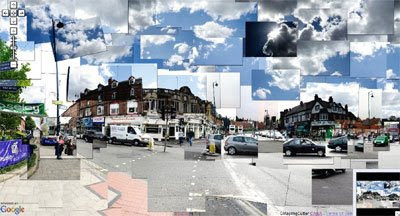 Matt Mutagh has created an amazing photo collage of Moseley in the UK. Matt then used CASA's Google Map Image Cutter to replace the Google Map tiles with his collage. The resulting map allows viewers to pan the image and zoom in on any detail. 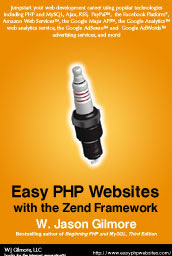 Jason Gilmore has just has had his book "Easy PHP Websites with the Zend Framework" published. Jason has made a few chapters freely available for download, including Chapter 9, "Integrating Google Maps". This chapter teaches readers how to use the Google Maps API to integrate Google's mapping features into a website. Readers will also learn how to use the Google Geocoder to convert mailing addresses into latitudinal and longitudinal coordinates. In the second part of the chapter the Google Map API PHP library is introduced, which offers a great solution for interacting with Google's mapping service. Did I mention, the chapter is free to download. If you have a little free time this weekend why not visit a classic car museum? Autopendium, the classic car website, has created a directory of Car Museums around the world. All 150 museums are shown on a Google Map. The museums can be filtered by country or by type. The Car Museums can also be downloaded as a kml file and viewed in Google Earth.